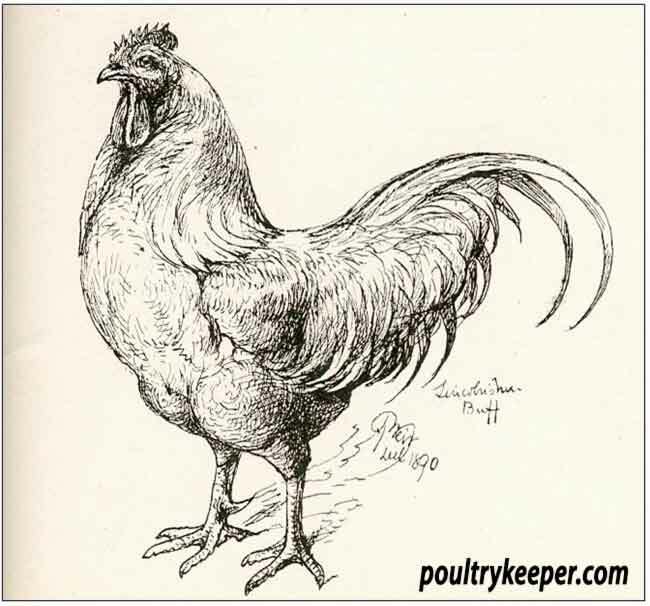 A variety of heavy large fowl, bred in their tens of thousands on the Lincolnshire Farms, from the 1850’s up to the early 1920’s and well-known in the London markets as the Lincolnshire Buff, but never registered as a standard breed. A Boston man wrote to Kidds Journal 1843 to say, no fowl can surpass the Dorking for the table, nor the Hamburgh for eggs. 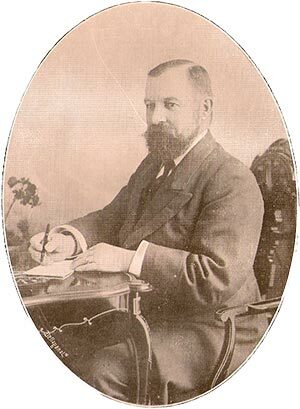 He goes on to tell of one hatch of half bred birds, a cross between the Cochin and the Dorking, which hatched in October, the mother died a fortnight afterwards, but the chicks reared themselves successfully. ‘It was very pleasing to watch the little creatures huddle together at night in hay I gave them. I have not yet tasted the flesh of the thoroughbred birds but those of the cross I speak of are excellent fowls for the table. When six months old, they weigh ‘from six to seven pounds each’. This was the commencement of this particular cross in Lincolnshire, and finding that they were hardy, easy to rear, quick in growth and readily fattened they gradually grew in the estimation of farmers and others, and so plentiful did they at last become, that after some few years they were known in the London and other markets as Lincolnshire Buffs. Thought to have been across between buff Cochin, red Dorking and the common yard fowl, most likely wheaten Old English Game and gold Hamburgh. The Dorking is thought to be the oldest of the British Breeds and as a large five-toed breed the Dorking would have been common on the farms in the 1850’s. The Buff Cochin originally came to this country from China in the early 1850’s where it was known as the Shanghai and later as the Cochin-China, the breed created a sensation in the country in poultry circles because of its immense size and table properties and excellent egg laying qualities. Cochin eggs were highly prized in days gone by, and were given to children as a special treat, and were known as Cochin-China eggs. But the Cochins’ vast amount of feather on body, legs and feet made it unsuitable for the muddy Lincolnshire farms. This may have been the reason for the first cross. Buff was a very popular colour towards the end of the 19th century and buff coloured poultry remained in favour with the Lincolnshire farmers. In the early part of the 1890’s Mr William Cook of Orpington in Kent, a very famous author and known nation-wide for black and white Orpington poultry, decided to introduce the buff Orpington, this was thought at the time to have been nothing more than a refined Lincolnshire Buff, and caused a lot of controversy at the time, but with Orpington Poultry being famous throughout the Country, the buff Orpington won the day. Anything bearing the name buff Orpington was saleable, or as a Lincolnshire farmer in Feathered World magazine, December 16th 1898 wrote, if I call my birds Lincolnshire Buff I can’t get more than four shillings each for them, bit if I call then Buff Orpington they sell readily at ten shillings each’. As late as 1907 Lincolnshire Farmers were still advertising in Feathered World, Lincolnshire Buff in one column and Buff Orpingtons in another, ample proof that they were both bred from the same stock but by 1915 Lincolnshire Buff had almost disappeared from Lincolnshire farms. Lincolnshire was once unique among the English Counties in so much as it had four distinct breeds of farm livestock. We still have Lincoln Red cattle and the Lincoln Longwool sheep, but sadly 1920 saw the demise of the Lincolnshire Buff chicken, and as recently as 1972 the Lincolnshire Curly Coat Pig was declared extinct, these pigs were white, long-haired, forty stone monsters that fell victim to the modern-day trend for a low-fat diet. Fortunately however, with the help of book published around the turn of the century by authors that include well-known names, such as Lewis Wright, Harrison Weir and Edward Brown, we have at hand information needed to recreate the Lincolnshire Buff. Lincolnshire Buff Male as depicted by Harrison Weir. This project was started in 1981 at the Lincolnshire College of Agriculture and Horticulture Riseholme small animals unit near Lincoln. Unfortunately by 1986 owing to personal changes and Government cut-backs, the unit was closed down and it was at this time that I volunteered to take on the project. As I am a Lincolnshire Yellow Belly born and bred and a poultry keeper since a boy, I thought this to be my duty to the County. With few remnants of Stock from Riseholme, and new infusions of Red Dorking and Buff Cochin blood I made steady progress over the years, including frequently displaying birds a the Lincolnshire agricultural show. In 1994 Lincolnshire Buffs were shown at the National Championship show as non standard breed by Mr Peter Hadgraft and myself. Considerable interest was shown in the birds and Peter, who had recently moved back to his native Lincolnshire and is a man with vast experience in breeding poultry, suggested that we should form a society to promote the breed. A meeting was called and a committee formed and on the 29th January 1995, the Lincolnshire Buff Poultry Society came into being. 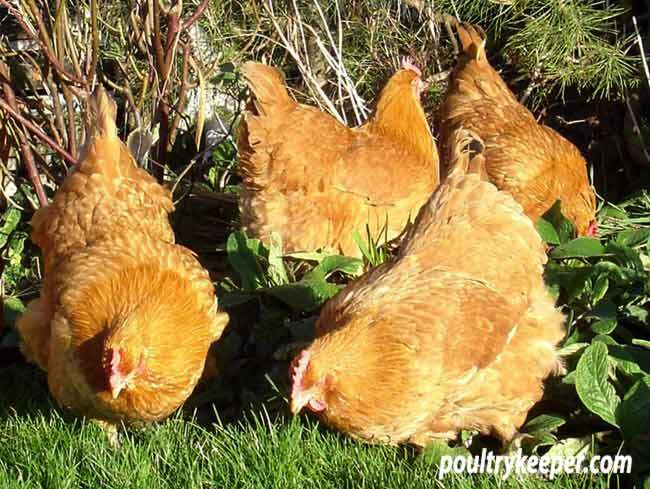 A proposed Standard was drawn up, and the next step was for the breed to be accepted by the Rare Poultry Society. This was achieved in 1996, and this paved the way for the Poultry Club to consider Lincolnshire Buffs as a standard breed. This was put before the Poultry Club meeting in January 1997 and we were accepted as a society and a standard breed. To my knowledge, this is the first British large fowl to become a standard breed since Reginald Appleyards White Ixworth in 1932 (excluding the auto sexing breeds) and after a period of almost 150 years the Lincolnshire Buff can now take its rightful place as a true standard British breed. Lincolnshire Buff Hens scratching in the garden. 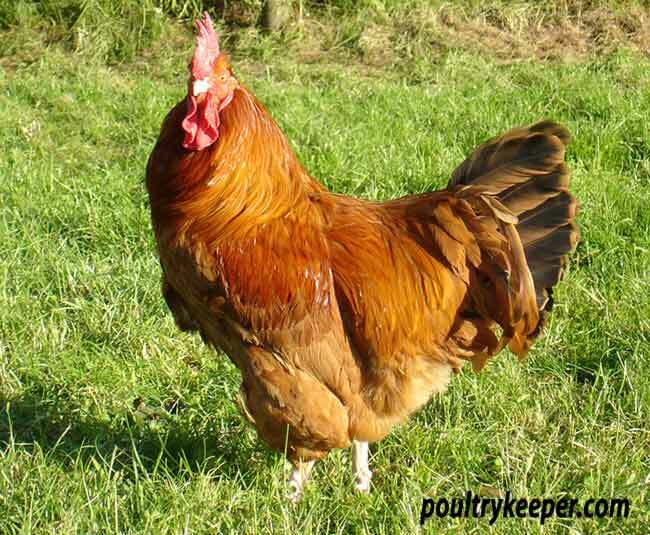 In this breed we look for a large fowl with males 4 to 5 kg and females 3 to 4 kg, a dual purpose bird keeping as close as possible to the old breed, but to a standard type, with a moderately long body, natural buff colouring (as in Nankin Bantams) with a full copper-bronze tail (in the male) medium to small single comb, clean white legs with five toes. The modern-day Lincolnshire Buff is highly suited to today’s trend for self-sufficiency and organic farming. 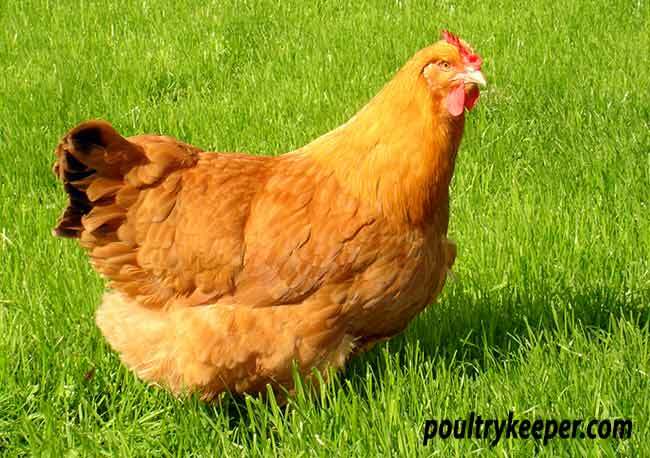 With its dual purpose qualities, good egg laying, pleasant appearance, calm temperament and its ability to brood its own chicks, this breed makes an ideal choice for the small-scale poultry keeper. If you would like to know more about this wonderful breed then The Lincolnshire Buff Poultry Society website has further information. Mike is the Chairman of the Lincolnshire Buff Poultry Society and was instrumental in re-creating the Lincolnshire Buff chicken breed.